Bulk storage is one of the major limitations in today’s “just in time” electricity delivery system and one of the great opportunities for Smart Grid development in the future. Only about 2.5% of total electricity in the U.S. is now provided through energy storage, nearly all of it from pumped hydroelectric facilities used for load shifting, frequency control, and spinning reserve. System balancing is provided by pumped hydro, combustion turbines, and the cycling of coal power systems. (In contrast, some 10% of the electricity produced in Europe is cycled through a storage facility of some kind, and Japan stores 15% of the electricity it produces.) Deployment and policy have been instrumental in long-term resource planning and management. Reduced System Inertia - Potential loss of system stability due to the high penetration of variable resources with low inertia properties). 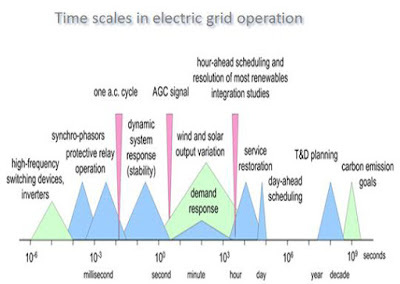 Smart Grid enabled demand response capabilities are the best short term solutions to address these issues. Investment in large amounts of electricity storage could ultimately address both the resource adequacy and resource management concerns; though technical and economic issues need to be addressed before such investment is likely to become significant. Regulation - Minor variations in load are automatically smoothed by slight variations in the voltage available across the system. Electrical devices generally having a working voltage range that they require, commonly 110-120V or 220-240V. Regulation is automatic control obtainable in 5 minutes. Market size is about 1% of peak load. Spinning Reserve - Power plants can be run below their normal output, with the facility to increase the amount they generate almost instantaneously. Synchronous Reserve - Additional power plants can be brought online to provide a larger generating capacity. Typically, these would be combustion gas turbines, which can be started in about 10 minutes. Baseload - The minimum amount of power that a utility or distribution company must make available to its customers, or the amount of power required to meet minimum demands based on reasonable expectations of customer requirements. Baseload values typically vary from hour to hour in most commercial and industrial areas. Capacity – The rated continuous load carrying ability expressed in megawatts (MW) or megavolt-amperes (MVA) of generation transmission or other electrical equipment. Capacity Credit - The amount of output from a power source that may be statistically relied upon, expressed as a percentage. Well sited wind can have a capacity credit equal to about 20% of its rated output. This means that reserve capacity on a system equal in MW to 20% of added wind could be retired when such wind is added without affecting system security or robustness. But the main value of wind is its fuel and CO2 savings. Dispatchability - The ability of a given power source to increase and/or decrease output quickly on demand. The concept is distinct from intermittency; and is one of several ways grid operators match output (supply) to system demand. Inertia - The physical property which allows an object in motion to continue to stay in motion, absent other forces. Traditional dispatchable generating units (such as thermal and hydro power plants) utilize large rotary generators which have large amounts of inertia. This property has a tendency to stabilize the bulk-power system with an output response in the event of a disturbance. Variable resources, such as wind and solar, have less or no inertia and, as such, cut back more quickly in response to disturbances (e.g., frequency excursions), which may contribute to power system instabilities. Intermittency - the extent to which a power source is unintentionally stopped or unavailable. 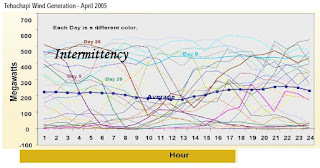 Intermittency is frequently used as though it were synonymous with variability. 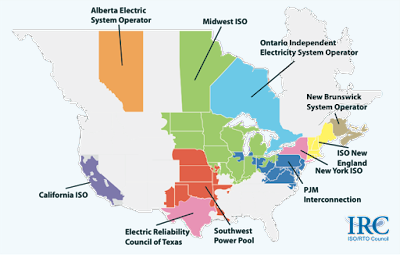 ISO - Independent System Operator - Also known as RTO - Regional Transmission Organization. In a deregulated marked, although utilities retain the ownership of transmission lines, they no longer control access to them. This responsibility has been transferred to a non-profit organization called an "Independent System Operator" which controls transmission of all electricity in the region. Load Factor (aka capacity factor): the average expected output of a generator, usually over an annual period. Expressed as a percentage of the nameplate capacity or in decimal form (e.g. 30% or 0.30). Load Following Power Plant - A power plant that adjusts its power output as demand for electricity fluctuates throughout the day. Load following plants are in between base load and peaking power plants in efficiency, speed of startup and shutdown, construction cost, cost of electricity and capacity factor. Nameplate or Nominal Capacity - Refers to the normal maximum output of a generating source. This is the most common number used and is typically expressed in Megawatts (MW). Nameplate capacity is the full-load continuous rating of the generator under specified conditions, as designated by the manufacturer, and is usually indicated on a metal plate attached to the generator. The nameplate capacity of a generator is generally greater than its net capability. Net Capability -The steady hourly output that the generating unit is expected to supply to the system load, as demonstrated by test procedures. The capability of the generating unit in the summer is generally less than in the winter due to high ambient-air and cooling-water temperatures, which cause generating units to be less efficient. 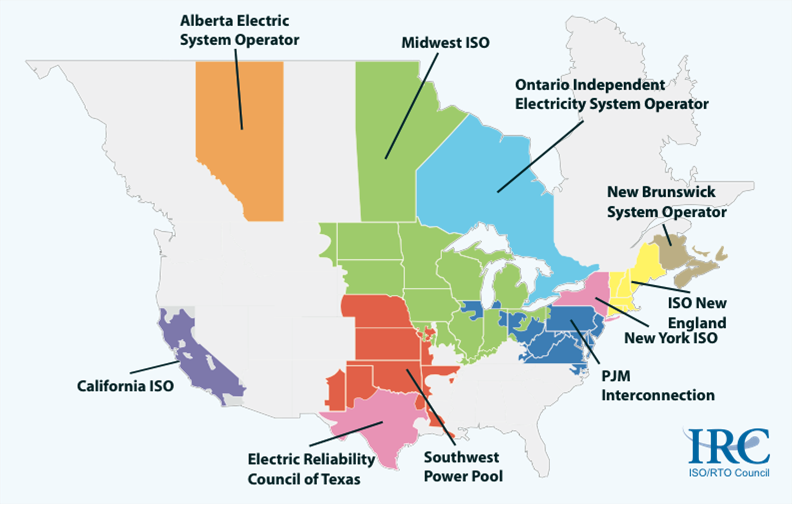 NERC - North American Electric Reliability Council (Wikipedia)- Sets adequacy and reliability standards for utility facility owners and operators. Penetration - The nominal capacity of a power source divided by peak demand in the system grid, expressed as a percentage. Penetration may also be used to refer to the amount of energy generated as a percentage of annual consumption. Sometimes older and always difficult to site, peakers are expensive to operate – requiring fuel bought on the more volatile “spot” market. But old or not, additional peakers generate additional greenhouse gases, degrading the region’s air quality. Compounding the inefficiency of this scenario is the fact that peaker plants are generation assets that typically sit idle for most of the year without generating revenue but must be paid for nevertheless. Reliability - degree of certainty a grid operator can have about the future output or a power source such as a series of wind farms or solar power stations. Reliability may be measured by the frequency, duration and magnitude of adverse effects on the electric supply. Solar output can be intermittent, but highly reliable. Similarly, but in a different way, a single 1.2 GW power station can suddenly fail, while the output of the equivalent number of wind turbines, (about 250 ) cannot all fail simultaneously and instantaneously. RPS - Renewable Portfolio Standards - Require a pre-determined amount of a state’s energy portfolio (up to 20%) to come exclusively from renewable sources by as early as 2010. Reserves - The NERC reliability rules require that the power system have in reserve electric generating capacity above the amount needed to meet peak electric demand. The amount needed is based on the largest contingency on the system—in other words, the failure of the plant, lines or other piece of equipment that is most critical to keeping the power grid running. In New England, the most significant risk formerly was if a large nuclear plant tripped off line or if the power line from Quebec failed. Some reserve capacity must be available within 10 to 15 minutes. Other reserves might not be needed for 30 minutes. The latter category of reserves addresses secondary contingencies. Until recently, VER scheduling in ISOs/RTOs was conducted hour-ahead using forecasts provided in that timeframe. More recently in systems with high and increasing VER production, day-ahead forecasting has become more important and efforts are being made to improve such forecasts for ISOs/RTOs’ reliability unit commitments and to encourage additional day-ahead VER scheduling. Practices vary in how these forecasts are incorporated into the scheduling process. Currently, in the day-ahead timeframe, VER forecasts are only advisory with no binding schedules or commitments. In the hour-ahead timeframe, the scheduling process is either bid-based or VERs are self-scheduled by a market entity based on the vendor forecast for that resource. Given that targeted VER penetration levels are expected to be around 20% to 33% of total energy production over the next 10 years in most jurisdictions, ISOs/RTOs are planning to continuously evaluate and improve their forecasting practices. VER forecasting will need to be improved in the day-ahead and two-hour-ahead timeframes as well as in the shorter-term (15 minutes and less) timeframes, that affect quick-start unit commitments and economic dispatch instructions. 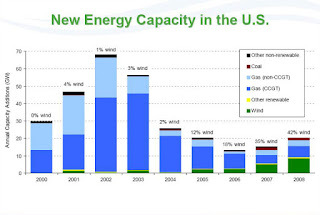 Wind contributed 42% of new US energy capacity in 2008. To manage this intermitent source, the grid will need to be smart. Conventional generating resources are relatively stable, schedulable, and controllable, and market rules and system operating procedures were originally designed around these characteristics. VERs, on the other hand, are intermittent by nature and are influenced by factors such as weather and geographic location that must be factored into forecasting and system management. But the challenges associated with integrating VERs are not limited to the accuracy of weather forecasts. Systems, products, and procedures need to be put in place to obtain and utilize forecasts, improve visibility of VERs, upgrade control centers and equipment, mitigate the intermittent nature of VERs, and modify operating procedures as required. In addition to these operational challenges, the successful integration of VERs will also require adjustments to the competitive marketplace. Bidding and dispatch procedures may need to be changed, ancillary services procurement may need to be adjusted, and the impact on energy prices and capacity markets will need to be monitored. Because resources such as solar and wind power are intermittent, the grid will require integrated monitoring and control, as well as integration with substation automation, to control differing energy flows and plan for standby capacity to supplement intermittent generation. Smart Grid capabilities will make it easier to control bi-directional power flows and monitor, control, and support these distributed resources. More powerful and accurate wind energy forecasting systems is one way to resolve the intermittency issue. Both regional- and plant-specific forecasts will allow more precise estimates of same-day and next-day hourly fluctuations in wind speed and resultant energy generation potential. Utilizing real-time and forecasted wind information to better integrate wind with the dispatch of other generation and demand-side options will provide frequency control and system stability. Inasmuch as a Smart Grid would provide the capability to dispatch ancillary services to balance intermittent wind resources, it is reasonable to attribute a portion of wind resource penetration to the emergence of a Smart Grid infrastructure. Storage is essential for electricity consumers where power quality and reliability is critical, such as at airports, broadcasting operations, hospitals, financial services, data centers, telecommunications, and many finely tuned industrial processes. Such operations frequently install energy storage as part of an uninterruptible power supply. In the future, storage, as both an end user and electric utility energy management resource, will become possible due to a confluence of high TOU rates, dynamic pricing, and lower cost energy storage systems. The challenge and costs for managing wind generation are a function of control area makeup in terms of size, type and number of generating resources under control, and transmission ties to neighboring control area. 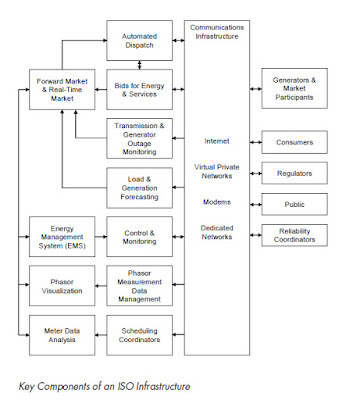 Smart Grid can help with distribution automation, communications, monitoring and control, and smart metering. Generation from clean energy generation substituting for power from less clean sources. 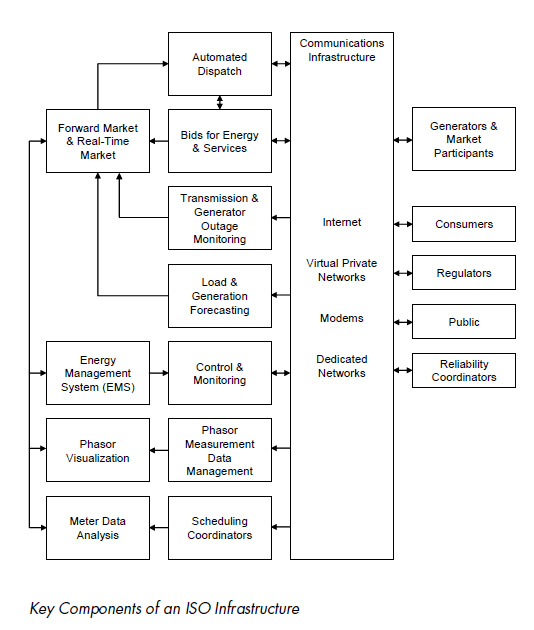 Paradigm Shift - The electric power business is based on capacity, system planning, and reliability considerations. Wind and solar energy don’t fit this model well because the fuel supply is uncontrollable and cannot really be dispatched. Renewable Variability - Current expectations are that up to 50% of a large PV system output can be lost in 1 minute. The correlation of dispersed large systems currently not well known. High Forecast Errors - Forecasting accuracy is quantified in terms of magnitude and frequency of forecast errors, as well as the capability during particular periods of the operating day, and of increasing importance the ability to predict changes in expected wind output over periods of time. Errors in the day-ahead forecast typically range from 6% to 10% Mean Absolute Error (MAE) of installed capacity, but several ISOs/RTOs have measured errors of more than 10% MAE. Aggregate forecast errors for the wind farms within a market or balancing area less than individual wind farms due to diversity. 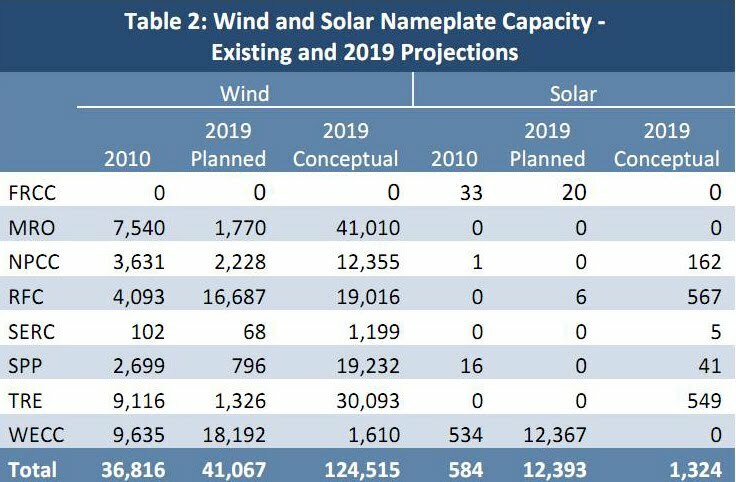 A particularly important forecasting problem is the ability to accurately forecast the onset, severity, and timing of significant increases or decreases in wind output resulting from changes in wind speed and high-speed cutouts of VER production resulting from excessive wind speeds. Locational VER forecasts will need to be improved in order to manage these types of events. Poor Data Quality of Forecast Inputs - Accurate forecasts rely fundamentally on high quality data made available in a timely manner to the forecast providers for use within their models. All ISOs/RTOs have experienced the effect of poor data quality on forecast accuracy, requiring improvements where necessary to telemetry data from VER sites. In addition, ISOs/RTOs have found that the turbine outage information of the wind plant must be provided within a reasonable time after a forced outage or de-rate is detected. Scheduling of planned turbine outages and de-rates also generally needs improvement with respect to both the timing and capacity changes. Typically, there are rules for how far from a sensor a wind turbine can be or how many meteorological data collection towers (met towers) are needed. 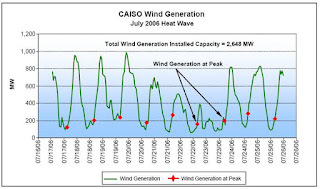 However, there are no standardized data requirements for wind VERs and only CAISO currently monitors meteorological conditions for solar plants. A common format for communicating data between wind farms and control centers, similar to Inter Control-Center Communications Protocol (ICCP), is necessary. Barriers to getting high quality data (i.e., more sensors per wind project or area and higher sampling frequency) are mostly driven by economics and relate to the installation and maintenance of sensor equipment. Managing High RPS levels - Twenty-nine states have developed and adopted renewable portfolio standards. At high RPS levels maybe half the generation will be inverter based, without rotating mass, inertia, or governor response. The system stability implication of this change is not understood. We don’t know what grid dynamics will be like when all that rotating mass is gone. Reserve Economics - Increasing the control burden has economic consequences. In the current paradigm, someone’s going to have to pay generators to stay in service, to provide backup and levelizing, even though they’re not operating at a high enough capacity factor to make money. Capacity payments to generators could be an issue in California in 2020. Ramping Issues - When renewables are producing energy, they do not always operate at a steady generation profile and can drop-off rapidly. Transmission Economics - Because wind resources typically have capacity factors below 50%, it is often the case that associated new transmission rated at the full power capacity of the renewable resource is not economical. For some wind power projects, it may be cost-effective to either build transmission capacity for slightly less than the full nameplate capacity of the project and simply curtail output during the small number of hours per year when output exceeds the available transmission capacity or to add energy storage to enable the dispatch of the energy at a different time. Visibility - in some ISOs/RTOs is the ability to forecast VER production from distributed resources located on distribution circuits or "behind the meter". These resources are currently invisible in many ISOs/RTOs but are subject to the same meteorological effects as grid-connected VERs. 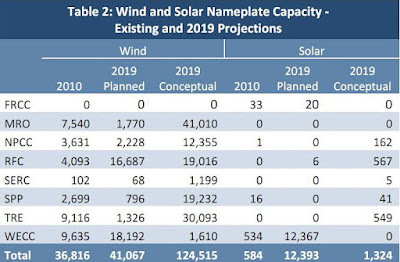 Quick Reserves - The introduction of large quantities of wind and other renewable types of resources are going to need fast ramping and fast start-type resources to help with that integration. How does wind generation affect existing variability and uncertainty? What are the costs associated with the changes? Can we maintain the integrity of the system under these new conditions? How do local resources compare to out–of-state resources? Can balancing area cooperation help manage variability? What is the benefit of wind forecasting? How can hydro help with wind integration? Clean Power Research - Napa, Calif - In May 2012 launched the latest version of its SolarAnywhere solar prediction tool, promising the ability to predict the minute-by-minute ebbs and flows of power from solar rooftops across entire regions, narrowed down to the square kilometer. It uses a combination of satellite imagery and solar installation data, along with patented methods to predict just how those systems will act in aggregate during the moments when hard data just isn’t available -- filling in the gaps between 15-minute satellite reads by predicting cloud drift.Founded by solar researcher Thomas Hoff in 1998 as a software and consulting firm, Clean Power Research is privately financed, without venture capital or debt financing, Ressler said. It has been profitable for some time, based on contracts and grants from various partners, including the California Energy Commission, CAISO (PDF), Pacific Gas & Electric, and Sacramento Municipal Utility District. NERC regularly publishes reports that assess the reliability of the North American bulk electric system. 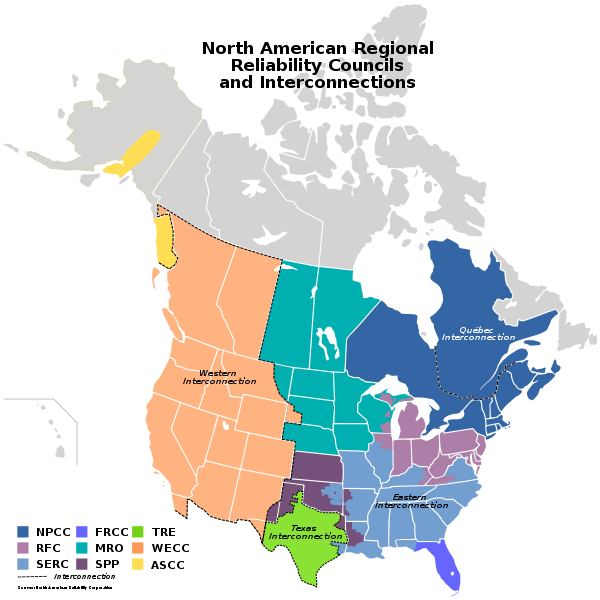 Long-Term Reliability Assessments annually assess the adequacy of the bulk electric system in the United States and Canada over a ten-year period. The report projects electricity supply and demand, evaluates transmission system adequacy, and discusses key issues and trends that could affect reliability. EWITS - The Eastern Wind Integration and Transmission Study is one of the largest regional wind integration studies to date. It was initiated in 2008 to examine the operational impact of up to 20-30% energy penetration of wind on the power system in the Eastern Interconnect of the United States (see study area map). This study was set up to answer questions that utilities, regional transmission operators, and planning organizations had about wind energy and transmission development in the east. Variable Energy Resources, System Operations and Wholesale Markets - Briefing Paper released by The ISO/RTO Council August 30, 2011 This paper looks at the efforts being made by independent system operators (ISOs) and regional transmission organizations (RTOs) to integrate variable energy resources.